In this surprising and highly unconventional work, Harvard law professor Mark Tushnet poses a seemingly simple question that yields a thoroughly unexpected answer. The Constitution matters, he argues, not because it structures our government but because it structures our politics. He maintains that politicians and political partiesвЂ”not Supreme Court decisionsвЂ”are the true engines of constitutional change in our system. This message will empower all citizens who use direct political action to define and protect our rights and liberties as Americans. 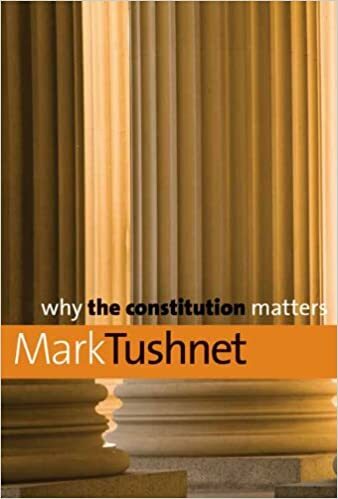 Unlike legal scholars who consider the Constitution only as a blueprint for American democracy, Tushnet focuses on the ways it serves as a framework for political debate. Each branch of government draws substantive inspiration and procedural structure from the Constitution but can effect change only when there is the political will to carry it out. TushnetвЂ™s political understanding of the Constitution therefore does not demand that citizens pore over the specifics of each Supreme Court decision in order to improve our nation. Instead, by providing key facts about Congress, the president, and the nature of the current constitutional regime, his book reveals not only why the Constitution matters to each of us but also, and perhaps more important, how it matters.